Rubin's conception of the figure of Jesus is interesting in its own right, and doubly fascinating in the context of the work of Jewish artists active in Europe and Palestine at the time. On the personal level, Rubin identified with Jesus' suffering and considered his agonies symbolic of the tribulations of the true artist. This Romantic view of the artist as a saint or martyr whose works must emerge from the ordeals of seclusion and emotional anguish was widespread in Europe at the turn of the twentieth century. Jesus as a symbol of the individual's agonized struggle for authenticity in the face of an indifferent society struck a chord with modern artists such as Gauguin, Schiele, and Kokoschka, who portrayed themselves as solitary ascetics and even as Jesus himself. 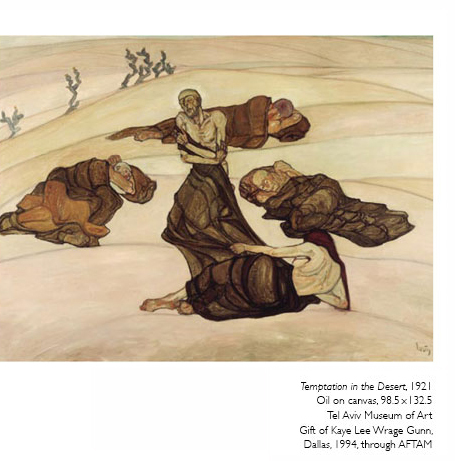 The possibility that Rubin might have chosen to do so – as his Self-Portrait and Temptation in the Desert (both from 1921) seem to imply, and as indicated by his own statements – is exceptional in the history of Jewish art, apparently constituting the first time that a Jewish artist cast himself in this role. Rubin also depicted Jesus in a way that was more resonant with the world of Jewish art of his time – as a figure admonishing the Christians for their treatment of the Jews. This view of Jesus as a moral ideal was espoused by painter Maurycy Gottlieb and sculptor Mark Antokolsky, both of whom portrayed Jesus facing his judges in the garb of a pious Jew, and also by Marc Chagall, who depicted Jesus crucified in a pogrom scene. Such representations emphasized Jesus' Jewish origins and enlisted his figure in the struggle against anti-Semitic tendencies within the Church. This conception can be seen, for example, in Rubin's painting Jesus and the Last Apostle. Highly original in this sense are his works The Encounter (Jesus and the Jew) and The Madonna of the Vagabonds, in which the figure of Jesus is audaciously fused with Zionist symbols, the latter signifying, for Rubin, the solution to the suffering of the Jews in Europe. Thus, in paintings made during his first year in Palestine, the figure of Jesus is transformed into the image of the robust Zionist pioneer. Rubin painted The Madonna of the Vagabonds in Bucharest in 1922, a short time prior to his immigration to Palestine. It can be considered a turning point in his early work, representing the transition from depictions of prophets and ascetics to a depiction of Zionist ideals, ideals which the artist was to fulfill in 1923. Interestingly, the Zionist message embodied by the painting is encoded in Christian symbols: the Madonna, seated on the ground and surrounded by green saplings, symbolizes renewal, her bare breast indicates fertility; the infant Jesus, whose birth in Christian thought symbolizes salvation and the beginning of a new era in the history of humanity, here symbolizes the "new Jew," reborn in his homeland. This work contrasts strikingly with the earlier Temptation in the Desert, whose composition is similar. 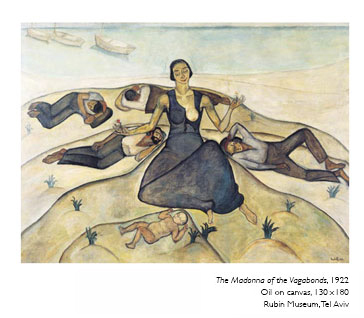 The tormented central figure and the seductive woman have here been replaced by the figure of the fertile Madonna and the young child born on the soil of Palestine; the other figures, asleep behind her, are the "vagabonds," pioneers who have come to build their new home in the Land of Israel. The painting Jesus and the Last Apostle presents Rubin's view of the state of European Jewry, and his hopes of a reconciliation between Christianity and Judaism. The figure on the right is a portrait of Gala Galaction – a Romanian priest, writer, and intellectual, renowned for his benevolent disposition towards Jews and Zionism and a staunch opponent of anti- Semitism in Romania. The scene, in which Jesus is seen weeping and holding out his wounded hand to Galaction, can be interpreted as a gesture of apology to the Jewish people for the suffering caused to them in Jesus' name. Galaction fulfills the role of mediator, a new kind of apostle. He is the last apostle, bringing a message of appeasement and mutual understanding between the two religions. 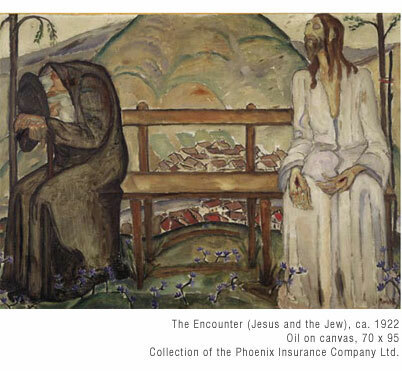 The painting The Encounter (Jesus and the Jew) was apparently painted in 1922, a short time prior to Rubin's immigration to Palestine. It also displays Rubin's unique conception of the figure of Jesus, and his identification with him. 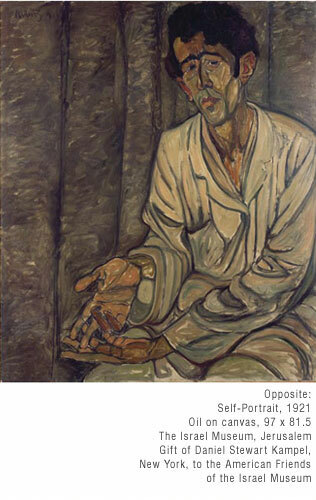 The position of Jesus' hands in the painting recalls that of Rubin's hands in his self-portrait from 1921. The painting presents the artist's highly original conception. 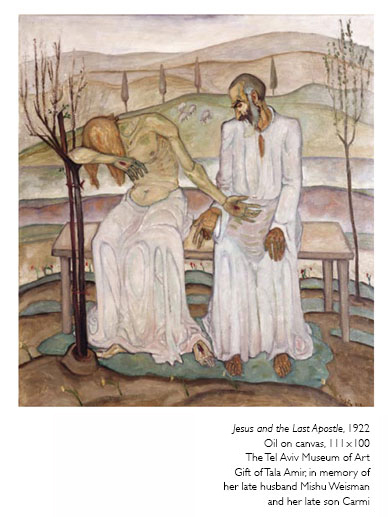 Linking the image of Jesus with Zionist symbolism: the stooped Jew, sitting by a wilting tree, is an image of the decline of the Jewish Diaspora, while the figure of Jesus showing his wounds, flanked by a young, upright stalk, represents the revival and renewal that must follow suffering. 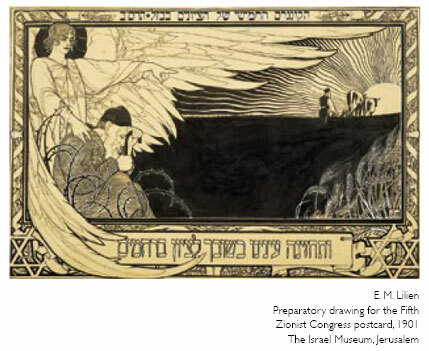 This iconography compares interestingly with the Zionist imagery presented in a postcard by E. M. Lilien, drawn in honor of the 1901 Fifth Zionist Congress: in the postcard, the elderly Jew, his head downcast, is contrasted with the proud, upright figure of a pioneer plowing the field. In Rubin's painting, Jesus is analogous to the Zionist pioneer: his resurrection symbolizes the revival of the Hebrew nation in its land. The painting Temptation in the Desert is a key work of Rubin's early period, particularly important in terms of his identification with the figure of Jesus. The painting can be interpreted as a synthesis of two scenes from the New Testament: one is the prayer at Gethsemane, in which Jesus sets out, together with three of his disciples, to pray for divine deliverance before his arrest and crucifixion; the other is the encounter between Jesus and Mary Magdalene in the garden, after his resurrection. These two scenes – an anguished, entirely human appeal to God, and an encounter containing hints of seduction – are fused into an image of the artist as a figure aspiring towards the spiritual, while battling with the earthly. Although this is not a self-portrait in the strict sense of the word, Rubin's statements regarding the painting and his identification with the central figure lead to the supposition, unprecedented in the world of Jewish art, that in this work Rubin depicted himself as Jesus.